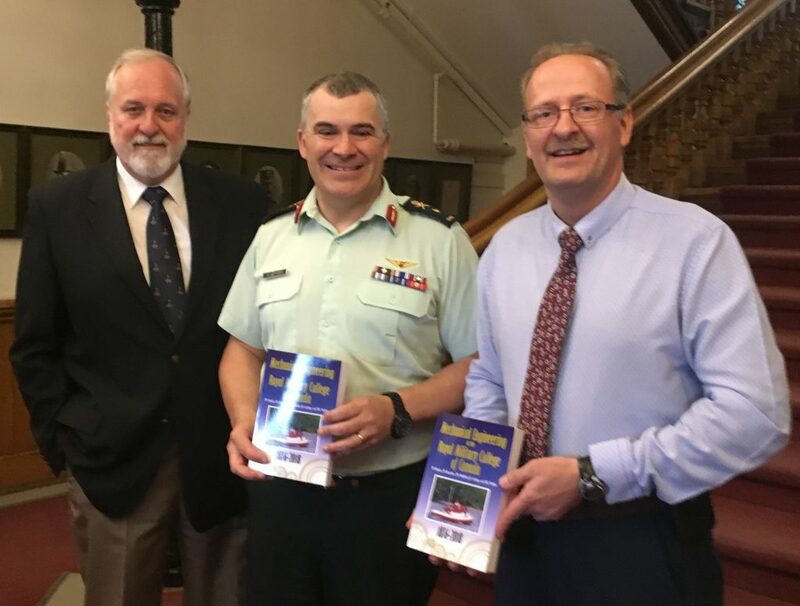 From the left – Dr. Mike Bardon, the Chair of the Board of Directors of the Cordite Foundation, presents copies of the Foundation’s newly published book, Mechanical Engineering at the Royal Military College of Canada 1876-2018, to RMC’s Commandant, BGen Sébastien Bouchard, and its Principal, Dr. Harry Kowal. Each chapter of the book covers a period of significance to the development of RMC and the department. Each provides a resumé of significant world events, Canadian political events, developments in the Canadian Forces and advances in technology that occurred in the period covered by the chapter. The chapters then go on to explain how the department and its programs evolved, as influenced by those contexts. The authors, Michael Bardon, Pierre Bussières, Kristin Hadfield, Graham Lindsay and Craig Moffatt, have brought to the book their experiences and perspectives as students, researchers, professors, department heads and deans. The English version of the book (427 pages) is available now from the Gift Shop of the RMC Club of Canada, to both walk-in and internet-aided customers. The French version of the book (437 pages) is currently undergoing its final editorial review and will be in stock and available for purchase from the Gift Shop before the end of June 2018. Both the English and French texts are/will be available in both soft and hard cover editions. The cost of the soft cover edition is $33 before tax for members of the RMC Club and $38 for non-members. If you want the hard cover version the price goes up by $10. All the proceeds from sales of the book will be split between the RMC Club of Canada and the Cordite Foundation. 8. 8500 Chris Ford, Secretary, Class of ’70: railroad democracy at it’s finest! 10. Top 5: Movin’ out day, just around the corner!